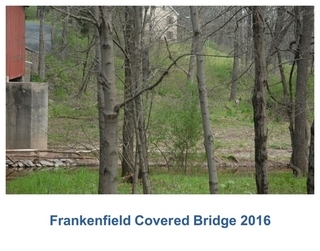 The Frankenfield Covered Bridge is featured in Kevin Frankenfield's Covered Bridges of Bucks County 2016 Calendar available for purchase on Lulu.com. only through Reunion or Kevin's Genealogy Web site. Location: Over Tinicum Creek in Tinicum Township, Bucks County, PA, just two miles upstream from the Delaware River or South of Sundale on the road from Point Pleasant to "Headquarters" called Cafferty Hill just beyond Hollow Horn Road (Near the Township Building). The Name: This Bridge was obviously named for a Frankenfield. A comparison of the 1876 and 1891 atlases for Bucks County tell the story. It appears that Michael Frankenfield (Grandson of Adam Frankenfield) was a large landowner at Sundale called "Headquarters". His land was divided to his sons. It is believed that the bridge was named for this section of the family. The bridge was built in 1872; the 1876 map shows houses near the bridge belonging to I. Hillpot, Ezra Frankenfield and Jac E. Frankenfield. In 1891 the same houses belong to Aaron Frankenfield (married Maria, the daughter of Isaac Hillpot, Ezra Frankenfield and J. Frankenfield. History: This covered bridge was built to allow people, horses and wagons a dry passage across the Tinicum Creek,an area once known for an abundant turtle population, on a common travel route of the day. In the winter time workers would "snow" the bridges for the benefit of uninterrupted sleigh rides. Historically covered bridges have been called "kissing" or "Wishing" because young couple used the shaded passages to steal a kiss or make a wish before entering a new bridge for the first time. The bridge was made with a roof to protect the wood and timbers from rotting. People were not to drive or ride over the bridges faster than a walk (about 3 to 4 miles per hour) and smoking was prohibited. Ithel Town, an engineer and architect from new Haven, CT, Patented the lattice like design in 1820. Timbers were held in place by wooden pegs know as "tree nails," allowing the bridge to be built by less skilled workers. The bridge was repaired in 1912 but a few years later,in 1918, it was damaged. At that time it had a brace out of the roof at north end and South ends. It was out of plumb, had four bad planks and Half of the remaining planks were badly worn, and the roof braces needed to be tightened. There was one poor beam and a joist tilted at the northeast end and several split joists. The country commissioners authorized its repair and the workers were paid $2 per day. They used solid oak timbers obtained below Plumsteadville. Originally the bridge was one span of 100 feet, with the additional 20 feet used to secure it to the shore. Today it has a concrete pillar in the middle, so to some it is now a two span bridge. It has exceptionally long stone and mortar walls on both side at each end of the bridge. In 1970 the County Commissioners again took into consideration the bridge that was then lopsided and in need of repairs. They consider all possibilities including building a new bridge. The group who met at the Frankenfield Reunion on June 5, 1971 signed a petition that was sent to the County Commissioners asking that every effort be made to restore, or otherwise rebuild or repair the present Frankenfield covered Bridge. It was repaired in the winter of 1976 and spring of 1977. Repairs included replacing older timber deck with girders with steel weathering beams, painting and reinforcement. The weight capacity of the bridge was increased to 20 tons, so that it could be used by school buses. According to a 1982 publication on covered bridges, the county had recently restored it. It is in excellent condition with vertical plank siding, gable roof, inside walls in the portal area and cut stone abutments. In 1984 it was one of thirteen remaining covered bridges in Bucks County of the 26 that had been built. Haupt's Covered Bridge (Which bears the name of some of Simon Frankenfield's descendants) was burned in January 1985 to bring the number of covered bridges in the county to 12. In October 1991 arson destroyed the Scholfield Bridge in Tyler State Park. 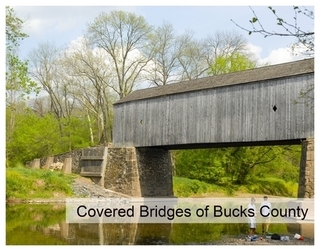 hence Bucks county had only 11 covered bridges left in 2000. Tinicum Conservancy: This is an organization that was formed to try to keep land in the state of conservation. When this group was four years old, it received it first conservation easement. It protects the right of further development on 65 acres around the Frankenfield Covered Bridge and covers part of the Turtle Rock Settlement. A five lot residential subdivision was made on Hollow Horn and Cafferty roads and on both sides of the Tinicum Creek. The five lots totaled 15 acres out of an 80-acre tract. The other 64 acres are jointly owned by the five lot owners and none of them is allowed to build on that land.